This morning when I took the cover off the cage, my parrot Sophy was lying on one side, with her mate Ning hovering over her. She didn’t open her eyes, and her breathing was labored. I scooped her up and put her on the table, and she barely opened her eyes. I knew then that she was dying, so I decided that cleaning the cages would wait. 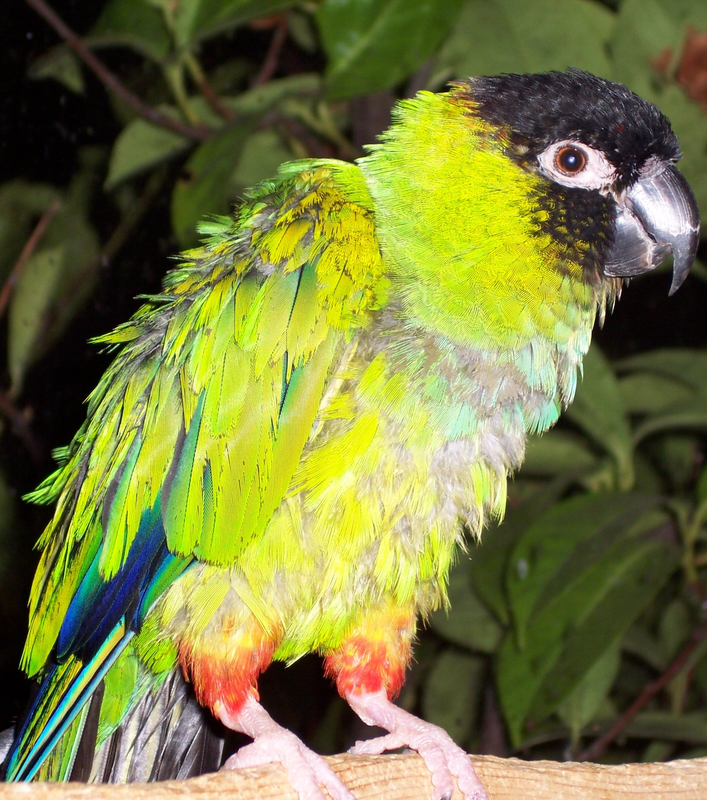 Sophy had been in a convalescence cage for the last few days after she slipped from a perch and started favoring her left leg. But her appetite was healthy and she was otherwise acting normally; the convalescence cage was just so she wouldn’t climb until her leg was better. Last night when I put her and Ning to bed, she was moving better, and I was cautiously optimistic that she was healing. But she was thirty years old – old for her species — and had been growing quieter over the last year, so her condition this morning was not a total surprise. I debated taking her to the vet, and decided she was better at home, where she could be in the company of her flock when she died. Besides, the way she looked, I was not sure she would live long enough to arrive at the vet, or that the vet could do anything I couldn’t. So I sat there as the sun rose, scratching her ear and trying to fed her corn. She refused the corn, and the loving regurgitation of Ning. In fact, she seemed to have trouble waking at all. When the sun poured into the living room, I stood with her for a while so she could bask in the light, something she would do for hours, given a chance. The sun on her feathers roused her, but only a little. I placed her back on the table and continued waiting, scratching her neck feathers. A few minutes later, she shifted her head awkwardly once or twice, as though trying to get comfortable. The eye that I could see grew misty. She seemed to stiffen, and all at once she had stopped breathing. Ning prodded her with his beak, and, when she did not respond, moved a body’s length away, preening himself with an air of apprehension. That was the end of my twenty-four year relationship with Sophia J. (for Jabberwock) Bandersnatch. It was an end that I could hardly have predicted from the start. 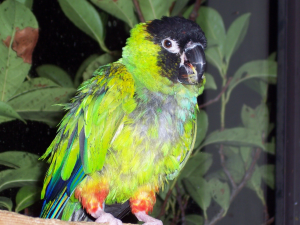 When we bought Sophy from the bird-sitter, she had been neglected and abused for several years. She had no tail-feathers, and she had plucked her breast. 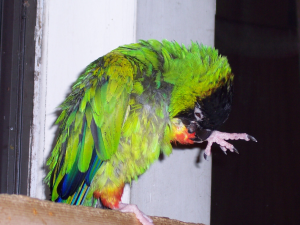 Recognizing her as a nanday conure was so hard that we almost had to take the fact on faith. We were told that she had locked in a cage for at least three years, and fed only on sunflower seeds. When she made a noise, a hand or a thrown boot hit the side of her cage. The only noise she could make was an outraged squawk. Under these conditions, what could we do? If ever a bird needed rescuing, it was Sophy. 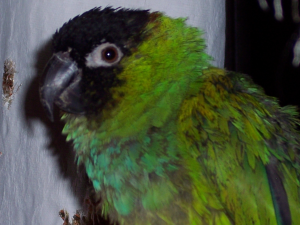 When the bird-sitter reported back to her original owner that we found that she had a sweet personality, his reply was, “Sophy has a personality?” – more proof, if we had needed any, that he had no idea how to care for her. When we brought her home, we placed her in the spare room, thinking to quarantine her for a month before introducing her to Ning. But the two birds started calling so excitedly that after a couple of hours, we brought Ning in for a visit. We were ready to supervise, but there was no need. Ning leaped down off my shoulder and sidled up to her on the perch and immediately started regurgitating. Sophy made a stifled sound of surprise, as though to say, “Excuse me, sir, but have we been introduced?” but her objections could not have been too serious. Moments later, they were mating. After that, Sophy and Ning were nearly inseparable, eating, bathing, playing with chew toys, climbing up on me. 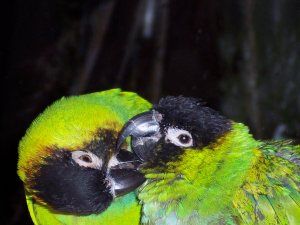 Always, in season and out, they mated, even on my shoulder. If one of them strayed more than the width of the living room, the other would start making anxious squawks. Ning was the more independent and aggressive of the two, but we soon noticed that anything Sophy wanted, she got. In anything she cared about, she was the dominant bird. With Ning as her companion, Sophy blossomed and started to accept us. She would go everywhere with him, even occasionally down on the floor, which she obviously regarded as a dangerous place. I remember the two of them constantly worrying a small tin back and forth as though playing football. One time, she crawled into one of Trish’s boots that was lying flat on the floor. She made an inquisitive cheep and, frightened by the echo, retreated squawking. Over the next couple of years, her feathers grew in. But she remained an over-zealous preener, so that her feathers often looked ragged and you could see the gray of her down on her breast. A few years later, she was healthy enough that she started laying eggs. The first one surprised her as much as it did us. She kept looking behind her at the egg, as if she could not quite believe that she had produced it. Other eggs followed – so many at first, that she became egg-bound had to visit the vet just after Christmas. Ning moped around, and, early on New Years’ Day, we took him to pick her up. His rapturous purr as he started preening her in the examination room was as true a sign of devotion as you could see anywhere. We bought a nest box, and watched her excavate the peat moss that lined it to her liking. Soon, eggs and hatchlings followed – Frumious (because what else should a Bandersnatch produce? ), Jabberwock, and Rambunctious, Rogue and Rapscallion, and Madrigal, all born in the living room. 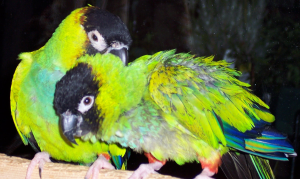 Sophy would spend hours cooing over her hatchlings, over-preening them but caring for them fastidiously until they were weaned. Once they were eating for themselves, they were Ning’s concern for a few months so far as she was concerned, and she always seemed relieved when her offspring left for new homes. A flock, a mate, and babies mellowed Sophy immensely. She never was much for hands after her previous experience, but she came to trust us enough that she would simply press her beak firmly around an encroaching finger, instead of drawing blood. We knew that she trusted us, because every morning, she would lean from the top of the cage to preen our faces, more gently than any parrot I have ever met. She was the only bird I trusted to preen my eyes, because even a sudden noise would not excite her into nipping me. When I lowered a shoulder, she would scramble across the cage, careless of any obstacles, to climb up on me. She would sit for hours on my shoulder, with or without Ning, as I worked at the computer. Sometimes, I would sing silly songs to her, and she would shake her tall and fluff out contentedly just at the corner of my vision. I could go on and on – but I see that I already have. But I can hardly remember a time that her playful and loving presence was not part of my home life. All the birds were a comfort to me in the weeks after my wife died, but she was the one who sat with me the most, and seemed most sensitive to my grief. In return, remembering her sitting contentedly on one leg on the back of the cage, I like to think that we helped her put the years of abuse and neglect behind her. As I type, Ning is restless, hopping from my shoulder to the table to the floor, and flying up to the cage. He keeps looking around as though expecting to see her, and is unable to keep still.